No, the title isn’t a metaphor for anything, I’m not that creative. The Narrator decided last week that he wanted to be a detective for Halloween this year. We pieced together the accessories, but needed a trench coat to complete the ensemble. So, while we were out driving around last weekend, we stopped into a roadside antique store since they had old clothes and things on hangars outside. Unfortunately, they didn’t have what we were looking for, but as we walked in, the lady running the shop told the two boys to root through the bin of old toys on the floor, and they could take what they wanted for free. Most of the product I had absolutely no interest in whatsoever, and the place bordered between ‘antique shop’ and ‘junk shop.’ However, my eyes settled on a small box which looked to be about thirty years old. 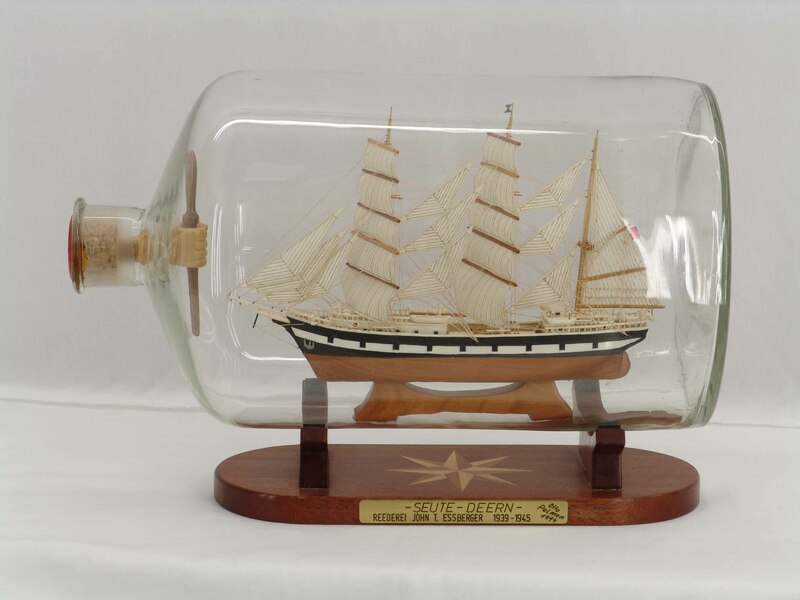 It was a ship in a bottle kit. 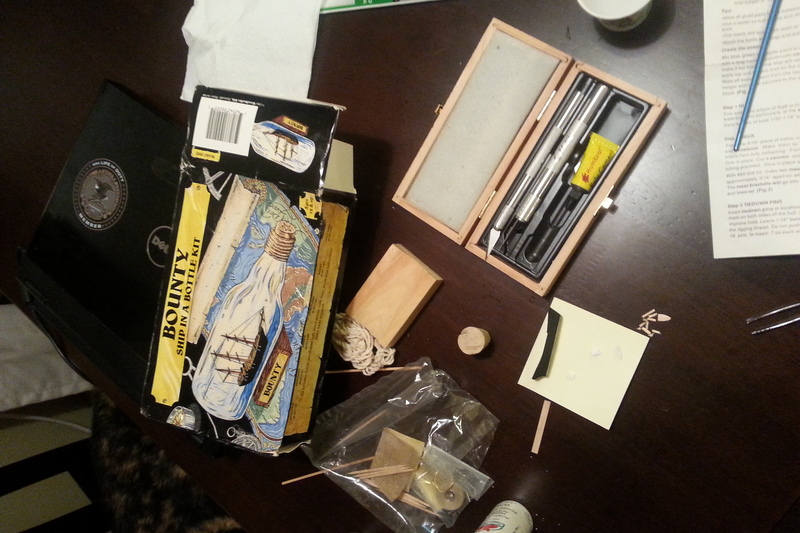 Complete, with instructions, bottle, and wooden ship parts. All for a staggering $3. Now, you guys, I’ve done a few models in my time. Some have turned out pretty good. Others…well, lets say some of my airplanes looked as though they’d already survived a few dogfights, and I don’t even want to talk about the Saturn V rocket I started when I was a kid. It turns out that there’s a reason this kit has been in a box since the 1980s. (1984 to be exact. I looked it up.) Because there wasn’t a 12 year old alive who could pull this damn thing off. Not only are the instructions fairly vague, mentioning things like “Imaginary mast holes” and using legitimate nautical terms which confused the bejesus out of a mountain boy like me, (I had to google a few things) but the scale of the thing is completely laughable. One sixth of an inch? Really? I survived mathematics in school. 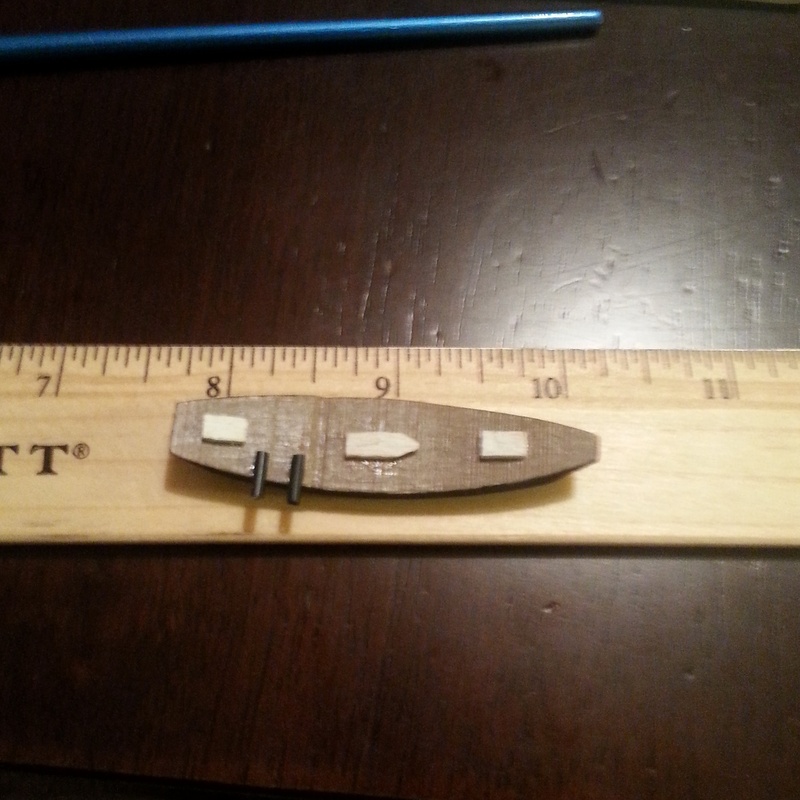 I’ve worked construction and carpentry, and I’ve done a little modeling (Not the naked kind) but never before have I been forced to measure anything in sixths of an inch. I’ve already been tempted to rename this thing “Shipwreck in a bottle” and go all hammer-time on the bits, dumping them into the bottle unceremoniously, and cut my three dollar loss. The Narrator, thinking like his father, has already suggested that we find a way to cut the bottle in half, stick the damn boat in there, and glue the bottle back together. I’ll keep you advised on how this thing goes because it could be amusing. The project is on hiatus right now, since I’m looking for a #60 drill bit….which I need to drill holes in toothpicks. …yeah, you read that right. I have to drill holes in toothpicks for the rigging. My father had one, but immediately upon finding it, he broke it in half taking it out of its case. Gives you a pretty good idea how this whole damn project is going to go. Wow. Good luck! That sounds like quite the challenge.